CC Outtake: How Many CCs Are There In This Shot? That’s great. My dad had an ’89 Trooper with a 5-speed. Over 225K when he traded it in. I wouldn’t mind finding one of those for wintertime. i only see 3 cars, the rest are boxes to me. A 6000, a Probe, Civic wagon….that pink purple thing at the end of the street….. I will say I have been to Oregon twice, I loved it, and its impressive to note the amount of older iron you still see being daily driven. Washington state too, I saw a Fuego Turbo in the parking lot of the Boeing musem….a Fuego! Turbo! I’ll try and find the pic. A6000, thank you. The front clip on that one was puzzling me. Just looked generic GM to me. Maybe a later model? Hmmm. Wikipedia indicates that the 6000 never had a letter prefix at the beginning of the name (unlike the T1000 and J2000). Am I imagining that, or were these sold as A6000s for a model year or two? AFAIK it never did. I think CARMINE is saying there is “a 6000” in the shot, not “a Pontiac A6000”. I zeroed in on that 6000 right away. I prefer the earlier one, but the later model might be an even more uncommon sight! I had an ’86 6000-STE which was the first year for the composite headlights, the rest of the line got it in 87. Boeing is the place to find a Turbo Fuego – it takes a rocket scientist to keep it running. Ford Probe, Jeep Cherokee, Toyota T100, Pontiac 6000, Volvo V70, Isuzu Trooper and Honda Civic WagoVan. 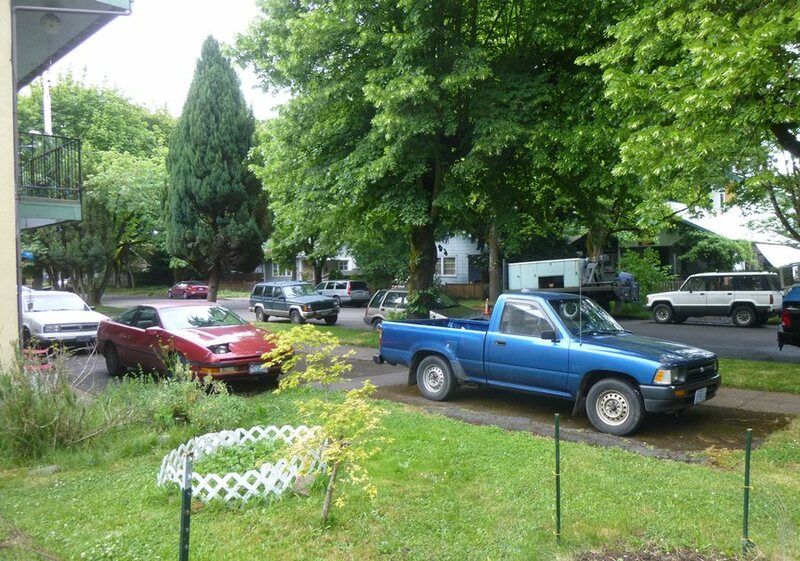 I think the pickup bed on the right side is an S-10 and I can’t make out what the car all the way down the street is. Maybe a 2nd gen Saturn SL… which makes either 8 or 9 bona fide CCs. They used the Hilux name for a few years…it didn’t catch on; and with the truck in that form, it was just “truck.” I think Hilux was axed about 1974…it made its way from the turn-signal-on-fender truck to the 1973 redesign, but disappeared shortly afterwards. Not to be a total nerd, but I’m pretty sure that’s an XC70, or Cross Country, not just a V70. is that purple thing a mercury capri? Looks like it might be a Hyundai Scoupe. The light purple car in the back down the street? It looks like a ’96-’98 Civic sedan. Could be, but it looks “blockier” to me. 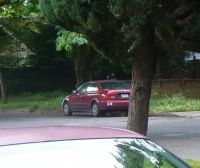 Yeah, I’m pretty sure that’s a Civic sedan upon further zooming. That Isuzu Trooper / Montero SUV is the rarest of the bunch. I might even go so far as to include the Toyota pickup on that list. Today’s bloated Tacoma is a far cry from the (perfectly sized) compact of the 90s. you would have to add that list the blue Cherokee as well. any future run is just name only. True on both the Cherokee and the hiLux. My wife’s car in college was a Civic wagon, a great little car and participant in many a road trip. It was our first car when we got married, and then about a month later, someone rear-ended it and totaled it with 50K on the clock. Coincidentally, it replaced another Civic she had in high school–that one someone rear-ended and totaled with under 10K on the clock. Haven’t had a Civic since, we felt cursed. That is weird….like stepping back in time. The ‘yota is probably the most recent, no? I think the Volvo is the newest, the XC first came out as a ’98, while the Tacoma replaced the Truck in about 1994. The pickup tail lights on the far right look like a recent Dodge Dakota and the purple thing looks like a 96-00 Civic sedan, but I could be mistaken. The overtly large tail lights with yellow blinkers are the tell tale signs for me on that one. Add a Montero and the 80’s great small SUV line up is complete. The pick-up tail lights on the far right look like a 2002+ Dodge Ram. Just realized that redesign was 10+ years ago. 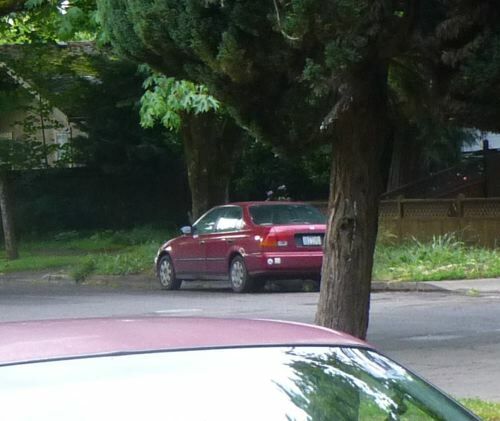 My guess on the purplish small car is based solely on remembering that color on only one car: a Geo Metro convertible. Enlarging the picture neither confirmed nor discredited my guess. The one thing consistent with a Metro is the appearance of small tires and wheeels. Does anybody else see that it appears to be a convertible? If I’m wrong about it being a GEO Metro, then I’m in agreement that it might be a Hyundai Scoupe. The purplish color of the mystery car looks like a Mk3 Jetta Trek edition.